"As parents we understand the need for kid friendly, fun and practical children's products. We also believe the need for kid friendly, fun and practical children's products. We also believe in the beauty and sophistication of clean, simple lines and minimalist design." Quilt Baby has recently rebranded to The Modern Baby Co. LLC, and while they're still the same great company you've come to know and love, there have been some exciting changes. Not only will they now be available in stores across the United States and Internationally, they've added to their collection. The same high quality, with impeccable designs including..
wall art.. whimsical, colorful and a great addition to a nursery, playroom or child's room. You can group them together or have one as a focal point. custom designed onesies.. classic white one pieces, with hand appliqued designs. my favorite is the elephant. baby mobiles... I would love to have one of these hanging above Finn's bed. Modern mobile's made from die cut foam, hand shaped wire, and monafilament thread. They are light and delicate offering your baby hours of visual stimulation and entertainment. Today The Modern Baby Company is offering one my all time favorites from their blanket line. The orange birds plush baby blanket (a $46 value) has microfiber on one side and high quality cotton on the other, whether at home or on the go it's sure to be a favorite of yours and your baby. Which Modern Baby Company design is calling your name? I love the Numbers changing mat. that is such a cool mobile!! I am loving the wall art. The mobiles are fantastic! I would love one. I want one of all the wall art. The animals are absolutely darling in their simplicity! Can I say everything? If you are making me choose, I would have to take the wall art - I love the chocolate elephants and the blue dinos! They are absolutely adorable! Oh my gosh, I love everything! And that is something that I rarely say. I'm tempted to try to make a onesie or two myself now and that wall art is just exactly what I want in our nursery. I'm going to have to scare up some money to go shopping! Love it! The little owl onesie is the best. Love the wall art....specifically the baby giraffes...how sweet! I love the hanging wall art! So creative! I love all the art work. Especially the owls and the elephants! I love both the mobile and the blankets!! I love the modern design of it all! I cannot get enough of their onsies...each one is adorable. I do however love those blankies too and who can't always use a new blanket? I love everything in the cherry dots pattern...the plush blankies, bibs, burp cloths, you name it! Gorgeous!! I just adore their baby mobiles... so fun! It is so hard to choose. I love the wall art, especially the owls and also the elephants. The orange plush bird blanket is super cute. I can never have enough babyb blankets. I love the elephant onesie and the blanket. Cute, cute! I love the morning glory changing mat. I am such a fan of the mobiles!! I do adore the brown/orange blanket with the birds. Adorable! oooh they are all just too lovely... but I am particularly drawn to the mobile and the wall art. The blanket looks oh so stylish and cozy too! That elephant wall art is calling my name. totally my kind of shopping spree! ... and the chocolate elephants are pretty darn sweet too! i love the wall art. such a cute site. Loving the Blue Bird onesie! SO cute! love the black dots bedding, very chic! Oooooh...hard to choose. I guess I'd say the wall art - either the chocolate owl or elephant. I love the onesies too, though! Those black and white pillows are screaming my name! Choose moi please! Katie S: I love EVERYTHING with the Orange Birds...particularly when coupled with Orange Burst. Love the mobiles and the toddler bedding - my son is sorely in need of his own bed! I am always a sucker for blankets. I love the sage full bloom pattern! -Kristin R.
I love the chocolate owls wall art! Great company! That bird blanket is beautiful! Love the patterns of the fabric they use! I love the Sage Full Bloom for my goddaughter. I really love the black dots and numbers collection! So bold! Oh my goodness! The orange bird blanket has been on my wish list forever! I would LOVE to win! Everything is so cute- but especially the wall art! I am in love with the morning glory plush blanket. It is adorable!! Love the onesies. Too cute. I love the numbers wall art. The orange birds are lovely too. Definitely the wall art...it is so perfect. either the giraffe onesie or orange birds blanket. I love the Black dots plush blankie. So cool! oh, i must have the orange birds plush baby blanket! to die for cute! I love the owl onesie...I'm such a sucker for owls! Wow, it's a toss up, that wall art and blanket would both go great in my daughter's nursery as accent colors. 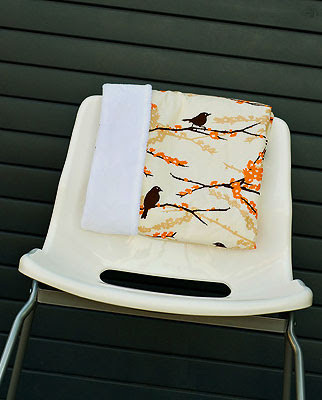 I love the orange birds fabric! those orange bird burp cloths are calling my name!! What a great company, thanks for the heads up. Would love to win for baby girl coming this summer! I love the pink birds toddler bedding! LOVE IT! The orange birds/chocolate burst collection is my favorite! oh I love that mobile too! I love the wall art! Too cute! I have had my eye on one of their mobiles. They are darling! I love the owl shirt. Great giveaway. My first time to enter here. VERY cute even with the birds :) my new little guy is in need of some updated blankets! AND I love the wall art...the owls are so cute. cute stuff. i'm loving the pink/chocolate/white Baby Mobile. Love the baby comforter, such great products!! Oh boy! Seriously, so darling. Just found out yesterday I'm having a girl! I do like the plush blanket in modern flower! I love the elephant wall art with the chocolate burst. Also, the modern flower collection. And the squirrel onesie is way cute! oh, i just LOVE that wall art! the owls or the elephants. i totally love the bird blanket, too. beautiful stuff. What cute products! The chocolate burst blanket would be so cuddly wrapped around the baby boy we're expecting in June. I love the pink birds crib bedding, so cute! I love the baby blanket, its so cute! The wall art. I adore adore adore the wall art! Sage full bloom has always been one of my favorite patterns. I love the wall elephant wall art also! I love the wall art! It is amazing! I love the wall art or onesies! So cute! The wall art of the owls is adorable! I love the squirrel onesie! Who knew a squirrel could be so darling? red/chocolate/white Baby Mobile is definitely my favorit! So many things to love! I love the morning glory blanket, the wall art, and those onesies are priceless. A little one can't have enough blankets. Love, love the orange polka dots pattern. Orange is such a cheerful color. I love the Black circles bib. So cute and modern! the entire orange birds set is so lovely. and i find the giraffe onesie absolutely adorable! I love the Chocolate Birds decorative pillow! So cute!! love the morning glory changing mat! I love the pink birds baby comforter. So cute! I love all the nursery bedding in ORANGE (spots/birds)!! !not blue,not pink, no fluffy bunnies.......just modern funky design!PERFECT! Everything is so cute. Love the onesies. I absolutely LOVE the orange bird pattern on that blanket! As well as the wall art. I've been looking for something to spice up my daughters nursery.. that would be perfect!! The "Orange Elephants" in the wall art section are so fun! darling mobiles! and that blanket is so lovely...crossing my fingers! This is such a fun giveaway. I love the wall art. The Passion Vine toddler bedding is just awesome. Love it! I love the yellow girrafe onsie, all the onsies are so cute though. Love this company, I particularly love their fabric choices, so yummy. Their mobiles are beautiful as well, thanks for the chance to win such a great blanket! I'm totally digging the orange elephants wall art. i love all the modern designs but the morning glory comforter is especially nice. I am loving the pink birds design for my toddler for a plush blanket! I really like the wall art. So cute! Thanks! Oooooh me likey it all!! I love the Orange Birds Floor Pillow. Lovely! I absolutely love the black dot blanket! I love the blanket.. It is so freakin cute. i've been lusting after the orange bird quilt for months! It would be perfect in my daughter's room! I love the Passion Vine blanket! i can't decide between the baby mobiles or the wall art! so beautiful! I love the Slate Dots plush blanket. Having a boy this summer and love finding great boyish items! Thanks for this chance to win! We just lost our blanket today so this would be perfect. I also like the snazzy changing mats. The wall art is fantastic! Courtnie Cotterell--the passion vine blanket. So cute! I love all of the morning glory stuff- such fun colors! The wall art and mobiles are great! Most of the wall art would look good in any room. Everything is so cute. I am really in need of a changing mat. I love all the prints! I really love all of the blankets. They would look so great with my baby wrapped up in them. I hope I win. oh my, i love it all! pick me please. I can't decide if I like the mobile or the adorable owl onsie better. Both so cute! I love the orange bird wall art. I could use it in many rooms of my house! I love the Tangerine Dots Plush Baby Blanket. So bright and cheery, and orange is a great gender-neutral color! The wall art would look perfect in my son's room! the wall art is amazing. I've been looking for something to fill the empty wall in my daughters room. I love the appliqued onesies. Who doesn't love cute onesies? The yellow giraffe wall art is caling my name! I like the "Sage Full Bloom" baby blanket. I love the changing mats! Oh I love Quilt Baby. I love the blankets and can attest to the softness of them. I bought some of her scraps once and her fabric is delightful. I love the orange birds plush blanket too. The Passion Vine/ slate dots toddler bedding set is adorable! would love to fix up my tot's room with this set. Beautiful! I like the Slate Dots blanket. I think my son would love to cuddle something that cute. I love it all! The wall art and bibs are dreamy. Of all the lovely goodies, the orange birdie blanket has to be one of my favourites! I adore the Sage Full Bloom plush baby blanket. It would be perfect for my first baby coming in June! Morning Glory/Cherry Blossom! So darn cute! Love anything in the Sage Full Bloom and Pink Burst print. Oh, I really love that blanket with the birds. Love passion vine /slate dots crib set. It matches the nursery. I love the orange bird bedding! 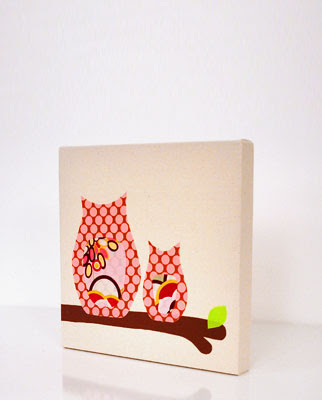 I LOVE the pink owls and the chocolate birds wall art! And I love the orange birds / orange burst bedding! I really love the plush baby blanket. I love it so much I might just keep it for myself and not give it to the little babe. Hey Brit! My fave is the modern flower plush blankie! Although I don't have a girl I think that would be the perfect gift for a baby shower. I love the Tangerine Dots. I love the black dots/number design! Beautiful! Loving the Modern Flower in every form. My favorite design is the "numbers" pattern! So cute!!! Everything is so adorable! I love the numbers changing mat. We could definitely use that! I love the blankets with the coordinating piggies. I love the wall art. Anything with owls make me happy. The orange birds plush baby blanket is my favorite!! I would love to win it!! The morning glory bedding would be so cute for my new baby girl come this summer. I am in love with the wall art...especially any of the bird motifs..it would match my daughter's nursery perfectly! The wall art is as darling as can be!!! I just love it! I've always love mobiles, so the orange/chocolate baby mobile is calling my name. The custom designed onesies are awesome! It is all so great. Love the mobile and the Joel Dewberry fabric blanket and I always find cute onesies so irresistible! It would be a hard choice, to be sure.